A copy of a letter sent to the President of the Liberal Party Senator Marie Poulin and Executive Director Greg Fergus landed in my inbox tonight. 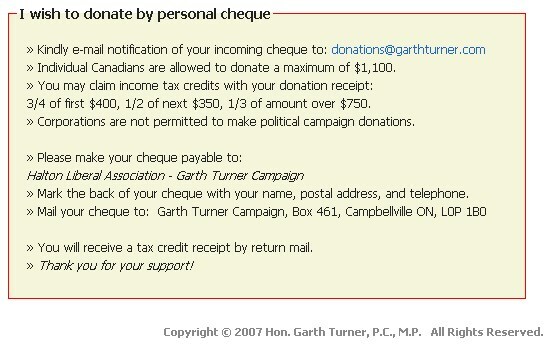 It concerns Conservative Party assertions that statements made in a recent Liberal Party backgrounder on what they’ve named the “In and Out” scandal concerning the “Conservatives’ apparent scheme to violate election spending limits” are in fact defamatory. The Conservatives stress that “Chief Electoral Officer Marc Maynard…has not accused any of the candidates or agents of breaking the law”. The letter concerns the defense of Michael Donison, Neil Drabkin, Andrew House, Aaron Hynes, Andrea Paine and Ian West. The letter states that “it is defamatory to suggest or imply that these individuals have engaged in illegal conduct”. 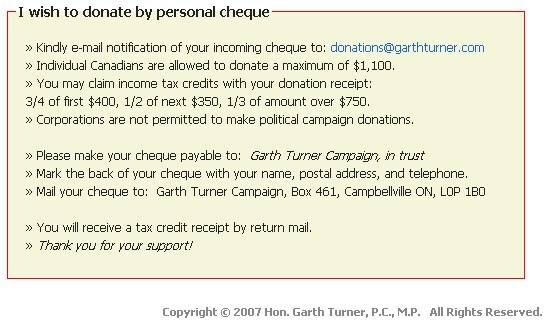 In this document, found on the Liberal Party website, the Liberals seem to imply that rewards in the form of government jobs were received by candidates who participated in the scheme that the Liberals allege. The Conservatives seem to assert that the Liberals must prove that their accusations are true or else the Grits have libeled the aforementioned individuals. Please read Steve Janke’s groundbreaking posts concerning this story, here, here and here. The other day, I discovered a tool on Facebook for advertisers that allows a prospective ad buyer to narrow down a potential target group for the purposes of showing an advertisement to a particular demographic. 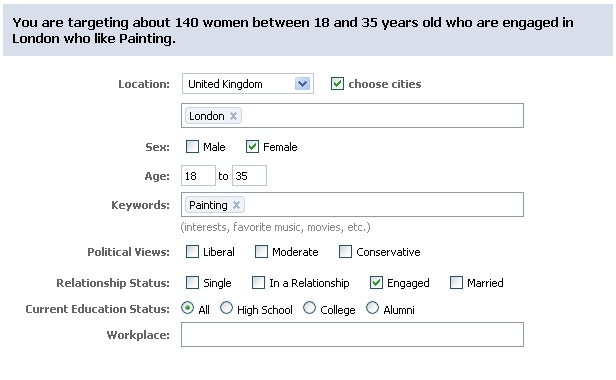 For example, one could select the United Kingdom, the city of London, females, aged 18-35, who like “Painting”, and have selected their relationship status as “engaged”. You’ll find that out of a pool of 1,612,980 people in London (or of 6,407,580 on Facebook in the UK), you’ll be targeting your ad to 140 people specifically based on the breakdown above. So, I thought another breakdown might be interesting. Facebook boasts 7,361,720 accounts in Canada. Of these accounts, 1,340 are at “CBC / Radio Canada”. 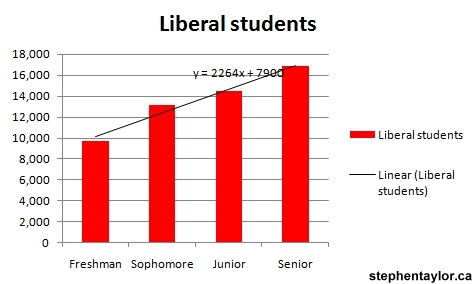 If one then checks off “Liberal” as a delimiting factor, we’re left with 180 accounts. 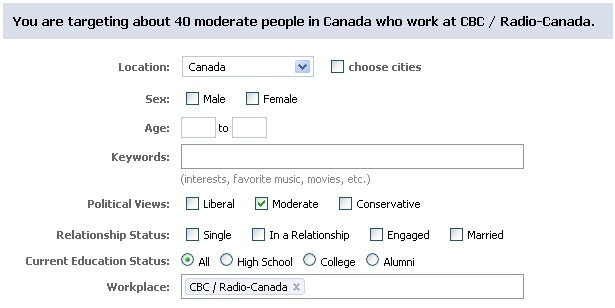 If we uncheck “Liberal” and check “Moderate” we get 40 accounts. 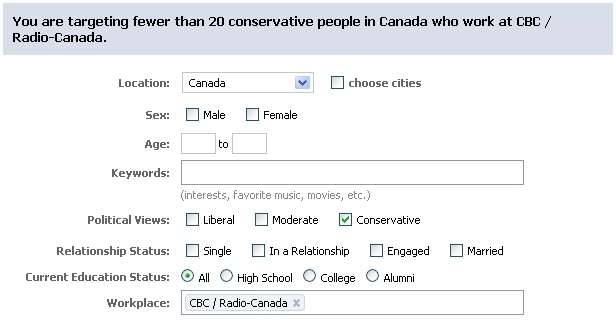 Now, if we uncheck “moderate” and select “Conservative” we get “fewer than 20” (Facebook seems to measure accounts for this application in blocks of 20. I assume that less than 20 could mean anywhere from 0-19 accounts). So, to summarize, there are 1,340 Facebookers at CBC. Of this group, 180 have self-declared as Liberal, 40 as Moderates, and 0-19 as Conservatives. Of course, this isn’t a scientific breakdown of political inclinations at CBC. 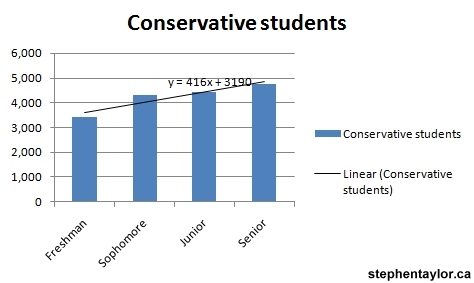 After all, it could be possible that Conservatives are much more shy about posting their “Political Views” on Facebook. Further, one cannot confidently say that Facebook is representative of the population at large. This is simply data presented “as is”, for your consideration. UPDATE: For those that have asked about the Canadian breakdown on Facebook, out of 7,361,720 Canadian accounts on Facebook, 618,240 are self-declared Liberal, and 281,840 Conservative. This is a 2.2:1 Liberal:Conservative ratio. 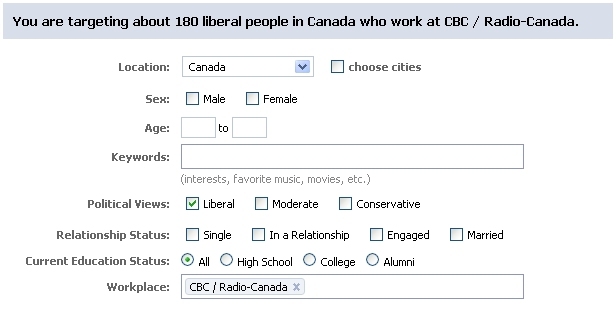 In contrast, CBC has at least a 9:1 Liberal:Conservative ratio among its self-declared political people with Facebook accounts. While they won’t offer a binding opinion (ie. a vote) on the government’s mandate, the Liberal Party of Canada is offering their anger on behalf of all francophones for what they perceived to be a snub against Canada’s bilingual nature. If one considers that “Liberal” is both a French and English word and that “Conservative” as a word must be translated into “Conservateur” in French, one can presume how they could have made the mistake especially in this time of desperation when they need to shift attention from their party to the Conservatives. Posted on October 18, 2007 Author Stephen TaylorCategories OtherTags bilingualism, conservateur.ca, conservative.ca, elizabeth whiting, liberal party, marie poulinLeave a comment on Liberal outrage! Prime Minister Harper has penned the mandate he seeks from Parliament for its next session and Governor General Michaelle Jean will deliver the Speech from the Throne tonight in the Red Chamber in about 2.5 hours time. Most observers expect that the Prime Minister will be asking a lot of Parliament as Stephane Dion, the Liberal and Opposition leader is weakened by fratricide within his own party. The recent recruitment of former Liberal leadership hopeful John Manley will also allow the Prime Minister to pen a few more ideological lines into the speech and dare Dion to vote against. There are a few factors which will determine the outcome of any brinkmanship that’s anticipated by some, however. For example, does the Prime Minister want to seek a defensible mandate and extend his term without triggering an election. In some cases, this is an advantageous move for Harper; the more time that he governs, the more of a record he has to run when he finally faces the electorate. However, Dion is in a wounded state and could eventually recover through his own strategy (more unlikely) or via unforeseen “events” (less unlikely). Depending on the crises and issues faced by the Prime Minister over the next year, public opinion may turn. For example, the economy is healthy right now. What will we see in one year’s time? Should Harper go for an election now? We can be certain that the NDP and the Bloc will be sure to come out immediately and oppose the Throne Speech claiming that they are they only principled opposition in Parliament to Stephen Harper and that Dion and the Liberals are weak. This will allow Jack Layton to represent the Canadian left and Gilles Duceppe to claim to represent both that constituency and Quebec’s interests. This has the benefit for both leaders of being the anti-Harper choice and of taking away Liberal votes as the Grits try and sort out what they stand for. Almost immediately after the Throne Speech, I can picture Layton claiming that the throne speech favours the rich (if personal tax cuts are a theme), the boardrooms (if corporate tax cuts are mentioned) and that this comes at the expense of “working families”. Duceppe will state that Harper cannot appeal to Quebec’s interests. Layton and Duceppe would also be wise to point out that Dion will not stand up to Harper and that the Liberal leader is ineffective and inconsequential. Dion is of course between a rock and a hard place. He has few options and none seem to portray him in a good light. Dion does not want to trigger an election for a few reasons. In the best of interpretations it’ll be seen as suicidal and in the worst interpretation it’ll seem absolutely foolish. Further, for this weakened leader, what he doesn’t need is to draw the scorn of a Canadian electorate for precipitating an election that his own deputy declared somewhat prophetically that Canadians “don’t want”. If Dion votes for the Throne Speech (after demands that Harper won’t meet fully, if at all), he will be seen to be an ineffective opposition leader. In fact, this voting outcome is a very possible scenario; we haven’t heard much pushback from Dion on Harper’s stated goals. In one scenario we could see Dion voting against the speech with the strategy of showing up with a only a handful of Liberal MPs in order to prevent the fall of government. The Conservatives have 126 MPs, and the Opposition (minus Liberals) has 79 (let’s leave out the 3 independents for the sake of an easier model). This leaves a 47 vote difference that Dion has to make up in order to tie the Conservatives (with the Speaker breaking the tie). Therefore, Dion must have at most 47 MPs show up to vote against the speech, unless he wants to trigger an election (which he most certainly does not want to do). Here’s where Harper could have some fun. The Prime Minister could order 46 of his MPs to be absent from the vote leaving 80 to vote “yay”. With the 79 non-Liberals opposition members with 79 voting “nay”, this leaves Dion to show up and vote alone. Those close to Harper say the man likes to play strategy with the issues rather than with the musical chairs in Parliament. Therefore this final scenario, while amusing, is unlikely. I do, however, think of it more likely that Dion will eventually vote against the speech. The embattled Liberal leader has to save face and any further wishy-washy behaviour by him will only encourage his enemies within his party. It is pretty much assured that the NDP and Bloc will seat every member for the Throne Speech vote. However, if we see Dion vote against, I wonder if we will see if his “honourable friends” in caucus line up behind him, triggering the election that he doesn’t want. UPDATE AFTER THE SPEECH: Jack Layton won’t support the speech. Gilles Duceppe won’t support the speech. Elizabeth May would support the speech, but she hasn’t any members. 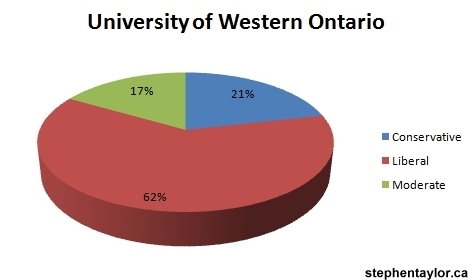 Stephane Dion says… ‘uh… we’ll sleep on it’. However, it’s likely that he will support the throne speech after overtures such as “well we knew it wasn’t going to be a Liberal throne speech” and “we’ll let you know tomorrow at 3:15pm” and “no government’s ever been defeated on the Throne Speech”. Although there’s news that members of his caucus are encouraging him to go (election-wise and therefore also into retirement).